Change is inevitable in coaching. Great coaches must be willing to embrace it. In 1992 I was a senior in High School playing for one of the top high school soccer teams in the state. We were successful because our coach was one of those “curious coaches”. 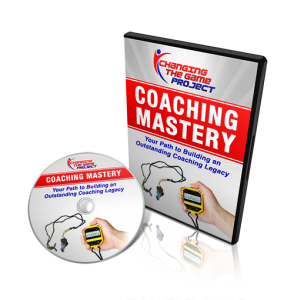 He sought new knowledge, learned new methods, and pushed the envelope of conventional coaching to find what would work next. It was the opening game of tournament play. We were the number one seed in the area and drew a lower seed. This gave coach a chance to try one of his crazy new ideas. Our warm-up was not your typical pre-game routine. We didn’t line up and run laps, or do static stretches in a circle. We didn’t get in 3 lines and pass/dribble on goal. Coach tossed out jerseys and had us play small sided games with “neutral” players to create numbers up situations. Then coach rearranged teams and had all of our “attacking players” playing against our “defending players”. Attacking players played toward the goal and the defenders played to small goals at midfield. Our keep away game became directional with purpose. Finally, we played small-sided games focused on scoring goals off crosses and loose balls in the box, with targets at the top of the box who could receive a “drop” for longer range shots. When captains were called, we sprinted to midfield. We were ready to play. We were out of breath, we were amped up, we were chomping at the bit to attack someone else. A club teammate of mine was captain for our opponent. I still recall his expression of disbelief. I told him coach said it gets us into a game mindset, is game specific, and will have us ready to start quickly. My counterpart said his coach laughed at us. Was our coach crazy for his unconventional pre-game routine? Should we have stuck with tradition and kept doing it the way everyone else had for all those years? I’ll let you be the judge. We deferred kick off and immediately pounced on the typical back pass to the center back (I am so old we called it a “sweeper”). He didn’t get a chance to touch the ball before I had intercepted the pass and slipped into the box undefended. We started like a drag race car who had been revving the engine and spinning the wheels long before the green light. They took 10 minutes to get the engine cranking. We had a 2 goal lead and full control of the match by then. We played fast, we played high pressure, we played with passion. The same way we had warmed up that night. Our opponent was slow, unengaged, and sleepy. Today, we see this kind of warm-up all over the world. Teams prepare for a match by simulating match conditions. No static stretches, no laps, and lines. Back then coach was laughed at for getting us ready for the game that way. Today he would be laughed at for not preparing us this way. Change is inevitable in coaching. Great coaches must be willing to embrace it. Our knowledge will change. The sport will evolve. Our players will be different. The best coaches are always trying new things. We must be willing to see opportunities to adapt and add to our game too. This is how the world’s best coaches lead their teams. Pep Guardiola did it at Barcelona and is doing it again at Manchester City (check out this great new book The Barcelona Way: Unlocking the DNA of a Winning Culture by Damien Hughes). Steve Kerr took everything he learned from coaches such as Phil Jackson and Pete Carroll, and layered in his own principles and style, adding his twist to things that were working and making them better. We cannot be so set in our ways we miss the chance to make adjustments in the way we engage, educate, and empower our athletes or we could completely miss the mark. If we are not ready to change, the world will pass us by, just like it did to Blockbuster Video. In 1998, Blockbuster Video had a market value of $4 Billion. At its peak, it had 9,100 retail stores. You couldn’t drive a few blocks in most US cities without seeing the big blue and yellow sign. In 2000, fledgling video-by-mail company Netflix approached Blockbuster with a crazy idea. Netflix wanted Blockbuster to buy them for $50 million. Blockbuster could promote Netflix’s online subscription service in their stores, and Netflix would run Blockbuster’s online presence. Why would a $4 billion dollar giant allow an unknown upstart to run its brand? Furthermore, why would Blockbuster even consider a business model that shunned late fees, since late fees made up $800 million in revenues? Netflix was laughed out of the room. Blockbuster stuck to what they’ve always done, even though the market was changing, the consumer was different and the model was evolving. By the time Blockbuster realized they needed to adapt, the proverbial ship had sailed. They never recovered. Only one Blockbuster remains open today (it’s in Bend Oregon, home of Changing the Game Project!). While Blockbuster has gone bankrupt, Netflix has continued to zig when the world wants to zag. It didn’t stop at eliminating late fees. When the market and consumers needed to “rent now” (one of the advantages Blockbuster brick and mortar stores offered), they adapted and shifted to a streaming model. When it called for renting movies anywhere, they shifted to a “stream to any device, anywhere there is an internet connection” model. Finally, when the market demanded original content (an advantage the big movie houses and television operators offered), Netflix started creating curated content tailored to consumers. What started as a small player is now a category killer across multiple markets and is threatening even the oldest and largest media companies who have been creating and delivering content to consumers for over a century. Netflix’s current market capitalization is over $152 billion (more than Disney and Comcast) because they listened, they adapted, and they made small changes. As coaches, we don’t need to give up all we know about coaching. We shouldn’t abandon all that has shaped who we are today and built the resume we hold. We aren’t required to completely change how we coach if that has brought us success. But shouldn’t we at least take caution from the lesson of Blockbuster and celebrate Netflix by looking for opportunities to adapt to the current needs of the market (the game), the makeup of our consumers (athletes), and the demands of an industry? If we are not willing to realize that the game is evolving and the players are different, we may end up going the way of Blockbuster. Sports has evolved. We have more data and science about youth sports today than the last 50 years combined. The way sports are being played across the globe is changing faster than ever. The kids who play sport are vastly different than the kids were a generation ago. The excuse for why our coaching is not working, “kids these days,” is not an excuse. It is a cop-out. Seek to understand them, and meet them on their turf. Teach them in meaningful ways so they actually learn what is taught. Instead of blaming them for our own failure, adapt what we are doing for the sake of their success. Are we “Blockbuster Coaches”? Are we refusing to change, even a little, in order to remain relevant? Or are we Netflix coaches, ready to shift, adapt, reexamine, and disrupt in order to ensure we are on the cutting edge of effective coaching? Heed the advice of Simon Sinek and Start with Why! You need a solid foundation to build your coaching philosophy upon. What is your why? Your tactics and strategy can change, but your core values, the things you hold dear about your teams such as integrity, sportsmanship, competitiveness, etc., those are unwavering. As Joe Ehrmann suggests in InsideOut Coaching, write out your coaching purpose statement, and stick to it. Layer in new tactics and techniques, but get your foundation right. Study and learn – The biggest problem with being at the top of the heap is a belief that what got you there will keep you there. The New Zealand All Blacks have a saying, “When you are on top of your game, change your game”. All the other competitors around you, and below you, are adapting to catch up and surpass you. If everyone around you is doing their homework, it does not matter how good you are, they will surpass you if you are standing still. Is there a little change that could keep you relevant? Find the biggest pain points your players face and help them to solve them – Ask yourself what obstacles are in the way of your athletes ability to perform. Ask them what keeps them from fully engaging and learning. Those who seek to solve other’s pain points and reduce their barriers to success end up having the most impact. Is there something you are ignoring that is keeping you from being the best coach you can be? Try it. If it doesn’t work, move on – This is difficult for all coaches. We don’t want to appear to fail or make mistakes in front of our athletes, but it may be the best gift we give them. Showing vulnerability, self-awareness, and resilience in the face of failure is a massive modeling opportunity for your athletes. Our willingness to try new things and our readiness to admit and recover is a lesson athletes carry into life. Netflix is not without their share of mistakes. They launched Qwikster and tried to separate the streaming service from the DVD rental service, and almost spelled doom for the company. They recovered by admitting a mistake and remedying it with the consumer. Netflix now has no fear of trying new things and pivoting when they don’t work. Is there something you could try tomorrow that might create a better learning environment with your team?